A little over a month ago, I did something I had never done before. Actually, it was a lot of things I had never done before. 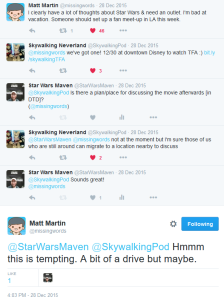 Having seen a tweet that popped up in Highlights in my Twitter app from Matt Martin, who would be visiting Southern California and looking to be involved in a meet-up to discuss Star Wars, I then saw a responding tweet from Skywalking Through Neverland that there would be a meet-up to watch The Force Awakens in Downtown Disney and that he should join them. 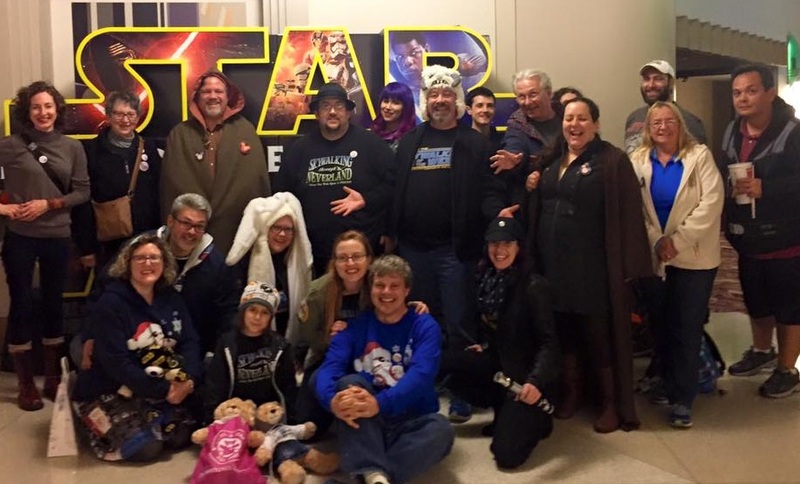 Having seen that and discovering, to my joy, that my schedule was open that evening, I was excited to meet up with some other Star Wars fans to discuss The Force Awakens and more. 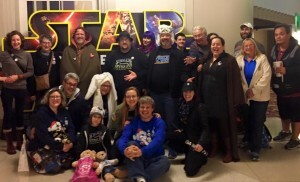 So, I told another Star Wars fan who would be interested and we met up with the group. We took up a couple of rows in the theater, which was perhaps less than half full, which was great. While waiting for the film to start, a young man sat down next to me with his girlfriend and began conversing with Richard, one of the conveners of this gathering, who was seated behind us. I soon realized that this young man who sat next to me was Matt Martin, who works for Lucasfilm. 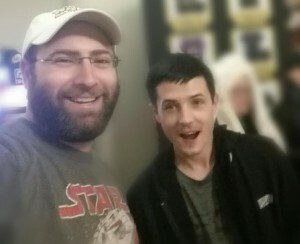 While we spoke with him, finding out that he had been working in social media for Lucasfilm and was soon moving up to working in the Lucasfilm Story Group with Pablo Hidalgo and Leland Chee, which was super exciting (I’m a big fan!). Watching the movie, which, being my third time having seen it, was the first time I had seen a movie more than twice in the theaters, and also my first time watching The Force Awakens not in 3D, it was also both my first time watching a movie in Downtown Disney, as well as my first time watching a movie with podcasters. Following the movie, a bunch of us then decamped to Trader Sam’s to discuss the movie over drinks. This conversing was an incredible time! For just the high level conversation about Star Wars, with which I was not used to having with the people I know, it was really wonderful. 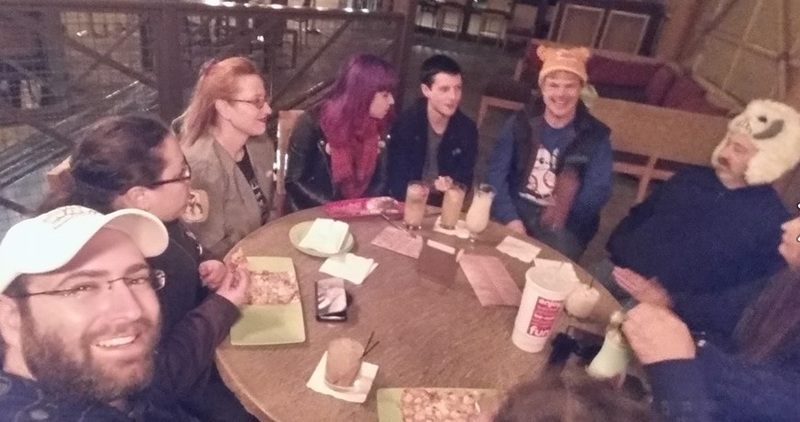 We were able to include conversations about The Force Awakens, other Star Wars movies, novels, Star Wars The Clone Wars, Star Wars Rebels, and more. It was really great! However, while that was worth having gone to just for all of that, it was really phenomenal to have also met Matt Martin and to have him be involved in the conversation! I super-appreciated having met him and the various insights he was able to share with us (although he didn’t share anything with us that he was not supposed to share), especially since he was so humble and excited to discuss the new movie and more. However, he did say that would be having to sign a non-disclosure agreement once he began working for the Lucasfilm Story Group. He also said that while he and Andi Gutierrez were the Lucasfilm social media team, they would be hiring two new people to join the team. Looking forward to future Star Wars meet-ups!